Bennett University Engineering Admission Form (बेनेट विश्वविद्यालय आवेदन फार्म) 2017: Bennett University engineering admissions 2017: Bennett University has announced the admissions in Bachelors of engineering for the batch 2017. The Bennett University Application form 2017 will be available in both online and offline mode. The last date for the submission of Bennett university Registration Form is 05th May 2017. The Bennett University is offering 540 seats in different streams of engineering, the interested aspirants can apply for the Bennett university B.Tech admissions 2017 can apply through the application form available on this page. About Bennett University: Bennett University is an autonomous university which is located in the region of greater Noida India. It was founded by the chief minister of Utter Pradesh Mr. Akhilesh Yadav. Bennett University is offering different programs for the bachelor’s degree and it is also offering MBA and Ph.D. for the applicants in different streams. 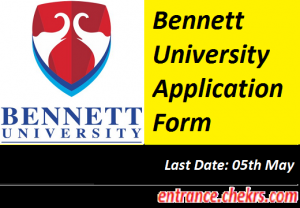 Bennett University is offering B.Tech admissions in Civil, CSE, ECE, EP, and Mech. The aspirant appearing/ passed 12th with PCM and have scored minimum 60% marks in the compulsory subjects. There is an exception for the aspirants willing to take admissions in Biotechnology. The aspirant Qualified or appeared for JEE Mains 2017 can also apply. Aspirants have to access the official web portal of Bennett University (bennett.edu.in). Now they have to click on the application form link. Aspirants have to fill all the correct details like name, age, father’s name, address, qualification, contact no. etc. Aspirants can pay the application fee via net banking, credit card, debit card etc. If the aspirants have checked the form carefully and the payment of the registration fee is done then thy can click on the submit button for the submission of the application form. The candidate must take a print out of the application form for the future purposes. The applicant can get the application form from the University campus or they can download it from the official website. Now they have to fill their correct information in the application form. After filing of the application for they have to attach a recent photograph and necessary documents which are required for the admissions. Details are given in the guideline of the application form. The application fee for the admissions will be paid through demand draft in favor of “Bennett University”. Aspirants will be selected on the basis of JEE Mains 2017 Scorecard. Tech Zone II, Near Dabra village. Bennett University has announced the admissions in Bachelors of engineering for the batch 2017. The Bennett University Application form 2017 will be available in both online and offline mode. Applicants are advised to submit the Bennett University Application Form on or before 5th May 2017. For feedback and queries, you can contact us by commenting in the comment section, we will respond you as soon as possible.